Lucy Macdonald, Portfolio Manager, Allianz Global Investors, gives an update on the Brunner Investment Trust and discusses the impact of low volatility in 2018, how much of a concern there is for political risk, positioning towards technology stocks and how 2018 compares as an investment manager. Visit brunner.co.uk for more insights or to contact us for additional information. PRESENTER: For an update on the Brunner Investment Trust I’m joined now by Portfolio Manager, Lucy Macdonald. Well Lucy, the Brunner portfolio has become much more concentrated in recent years, why is that and how has that impacted on performance? LUCY MACDONALD: Well we’ve concentrated it down in several stages, and it’s gone down from a few hundred down to 70 stocks. The reason why we’ve done it is to really focus it on bottom-up stock selection and to improve the performance. And that’s what we’ve seen. PRESENTER: So how do you go about analysing companies for those qualities that you’ve mentioned? LUCY MACDONALD: Well we’re looking for companies which can grow their top line over a long period of time, and we like companies which have got exposure to structural growth wherever possible. And we have analysts around the world in San Francisco, London, Frankfurt, Hong Kong and Tokyo who enable us to find those companies. And we also use quantitative screens which filter through all of the opportunities to make it into a more concentrated list, and then through our process into a more concentrated portfolio. PRESENTER: 2017 was a year of very low volatility. That hasn’t really been the case in 2018. Why is that, and what sort of impact is that having on how you invest? LUCY MACDONALD: Volatility has been low for the last 10 years now, since the financial crisis, because of the availability of money and quantitative easing. And we are now expecting that to normalise as quantitative easing is removed and liquidity peaks. So we are expecting some more volatility spikes and on average volatility to rise. Now what we saw earlier this year specifically was a good old fashioned inflation scare that we haven’t seen for a while, which then led bond yields to spike up. And then that had its impact into the stock market as well. And at the centre of it there was concern about one particular product, which was a volatility product, and the concern about that then really reminded people about going back to the financial crisis when there were financial products they didn’t understand with acronyms that they didn’t know what they were. And it took everyone’s mind right back to that time. So that telling passed, volatility has subsided again. And now we are beginning to see it rising in emerging markets with Venezuela and Turkey. So we’ve yet to see that really come back into developed world, but that could be a source of volatility going forward. PRESENTER: But do you think that those are just individual crises that affect just the countries involved, or could there be a contagion effect? LUCY MACDONALD: There could be a contagion effect. The link between these crises is the strength of the dollar and that remove of liquidity. So, as you get that, if you have countries which have high external dollar debt, then they are very vulnerable. And this is a very old fashioned type emerging market crisis. We’ve seen it in Asia, historically, and we’ve seen it in Latin America in the 1970s and 1980s. So we’ve seen this playbook before, and it’s happening again. And so it could get back into the developed world either through the mechanism of the financial markets, financial sector, the banking system, or it could be through the non-financial companies that have unhedged exposure in these countries. PRESENTER: So which are the next potential dominoes that you’re keeping an eye on? LUCY MACDONALD: Any of the emerging markets which have high external debt are vulnerable. But at the same time we also have increased risk from the trade frictions and from a slowdown in China. So any country which has exposure to the supply chains which are going in and out of China and connecting up to the US are vulnerable. PRESENTER: Well you mentioned trade wars, brings President Trump into focus. How worried are you by the amount of political risk that’s out there at the moment? LUCY MACDONALD: Well our focus is on the impact on growth and potentially on corporate profits further out. So far that’s been quite limited, and the companies we invest in have seen no impact to date. However, they are looking at potential impact on costs if they are big importers, their capex, uncertainty about that, but also potentially relocating factories if they need to do that. PRESENTER: Given everything you’ve been discussing, what do you think the chances are that there’s a market correction on the horizon, and how does that affect how you’re running the portfolio? LUCY MACDONALD: Where we’re starting at the moment, the probability is that returns are lower than they have been in the last few years. And that’s because we see this peak in liquidity. We think that growth is probably peaking this year as well, because of the big impact from tax reforms. So that’s very strong this year, which will not be repeated next year. And also valuations are at a relatively high level. So all of that suggests to us that you’re likely to have lower returns going forward than we’ve had. Whether we get a sharp correction or just a more moderate return environment is unclear. But whenever volatility is very low there’s always a potential for a spike. And some of these issues that we’ve been talking about, particularly trade friction, politics and emerging market risk, are all potential triggers for a correction. PRESENTER: Given you want to keep growing the dividend, does that restrict the kind of stocks that you invest in? Do you have to buy stocks because of their yield? LUCY MACDONALD: No, it’s a dual objective for the trust, so one objective is to keep that real dividend growth going. As I said we’re more confident than ever we can do that. The other objective is to outperform its benchmark. And since I’ve taken over the portfolio, we have moved more overseas. We’ve concentrated the portfolio and we’ve changed the benchmark to be more overseas and we’ve outperformed. So we feel that we are achieving on both of those objectives. PRESENTER: The discount on the trust has come down in recent years, but it’s still comparatively wide. I think about 11% roughly. Why is that? LUCY MACDONALD: Well the one remaining factor that we think, having restructured the balance sheet, having improved the performance, having taken it more overseas, the one remaining concern that people have is that there is quite a large shareholder, Aviva, who own 18% of the trust. And that seems to be a slight concern of an overhang. And that is the one factor we think that is still responsible for a discount. PRESENTER: So the market thinks Aviva over time would like to be a seller rather than a buyer. LUCY MACDONALD: Indeed, and over time that’s true. But our understanding from speaking to them is that it is not something that is going to be happening in a hurry. PRESENTER: And you mentioned you like structural growth stories, what’s your attitude to technology stocks, particularly because they’ve had a really strong run over the last few years? LUCY MACDONALD: Well technology stocks that we like tend to have some structural growth, but we also like to have the dividend as well. So we’re not really positioned in the most expensive and highly volatile area of technology. We have a lot of exposure to cloud, which we like. We like the whole business transformation. And we have a relatively limited exposure to social media, which we feel is one area where there could be some more risk of either regulation or a slowdown. PRESENTER: One of the buzzwords in technology is digitalisation, what does it mean to you, how does it affect how you look at investments in that space? LUCY MACDONALD: Well for us digitalisation is really about the whole of the market and the corporate sector; it’s not just about the tech sector. And we invest in companies which are benefiting from that. But from our perspective the whole corporate sector is going online, and we are at a relatively early stage of that. Some industries are further ahead and some are just starting. But all of the corporate sector is going that way, and whether it’s financials, whether it is industrials, and that is something which we are looking at. So whatever company we’re looking at, we want to know about their online strategy. We want to know how they are investing, where they’re investing, what their digital assets are, what their digital usage is and how digitally enabled their people are. So this is all part of the analysis that we’re doing for all of the companies that we’re looking at, not just in tech sector. PRESENTER: Given if you like everything’s becoming a technology play to some extent, if you look through that underline, what are some of the subsectors that you particularly like at the moment, and as importantly what are you avoiding? LUCY MACDONALD: Well we particularly like across the market those companies which we feel are leading as far as this digitalisation is concerned. And so they are companies which have got good digital expertise on their board, which have shown leadership within their own industry, and that are managing to change their company if it’s needed, or if they’re a new company to gain market share. So that’s really what we’re looking for as far as the companies are concerned. On the other hand what are we avoiding? Either industries which are so severely disruptive that their structural growth is just disappearing, or companies within those industries which are really lagging on understanding the digitalisation, or doing anything about it. And so it’s very high up on the agenda of the company meetings that we’re having is what are you doing in the digital space? Now, if it’s a retailer, what is your ecommerce strategy? If it’s an industrial company, what services are you now being able to offer through technology? How is that changing your margin, and what’s your investment? PRESENTER: Now you’ve been at Allianz Global Investors since 2001. As you look at 2018 is it now more difficult to be an investment manager, easier or just different? LUCY MACDONALD: Well actually I’ve been investing since the 1980s. And what is different now is technology. 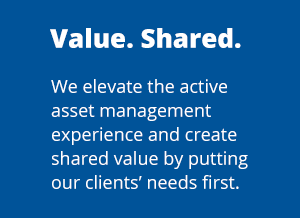 I think what is different in the industry, the asset management industry, is margin pressure. And really from an investment manager’s point of view, you are fighting also against the passive. And so there’s a big focus on performance. It’s always been there, but I think it’s even more intense now to show that by being active you are adding value. That’s increasingly important. And also I think the other thing which is very much at the moment is yield. And the fact that the interest rates are still so low that the ability to find yield that’s growing, it’s still quite a scarce thing. PRESENTER: We have to leave it there. Lucy Macdonald, thank you very much.